May Daze Round Robin Weekend Madness! TWO days, FOUR teams, SIX full length bouts. It’s going to be a CRAZY weekend of roller derby at the Dollhouse this weekend! 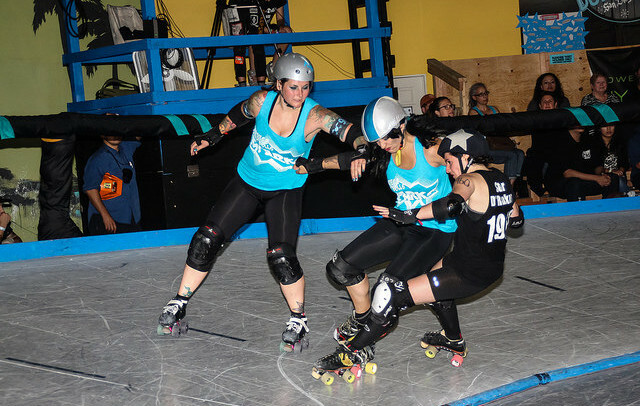 If you love roller derby, like we know you do, this is the perfect weekend to devour some much-needed action. Cheer on the San Diego Sparks – your hometown favorites, the Orange County Psycho Ex-Girlfriends, LA Derby Dolls and Penn Jersey She-Devils. The Sparks, San Diego’s secondary travel team, have had a tough but inspiring season thus far. With two hard-fought losses against the Beach Cities Riptide Rollers on flat track and the LA Derby Dolls Doll Parts on banked track, the Sparks still consider themselves a strong contender in this round robin. The team has only been together since February, but they’re making enormous strides with every game played. With the largest roster of 20 skaters, the Sparks will have the benefit of allowing skaters to rest during the long weekend. Several stars are emerging who fans should keep an eye on: Hit ‘n Run who jams like a gazelle and blocks like a wildebeest, Hard Kase and Minxy who can both block and control jammers with precision, and Slay Shawn who jams with nuclear power. 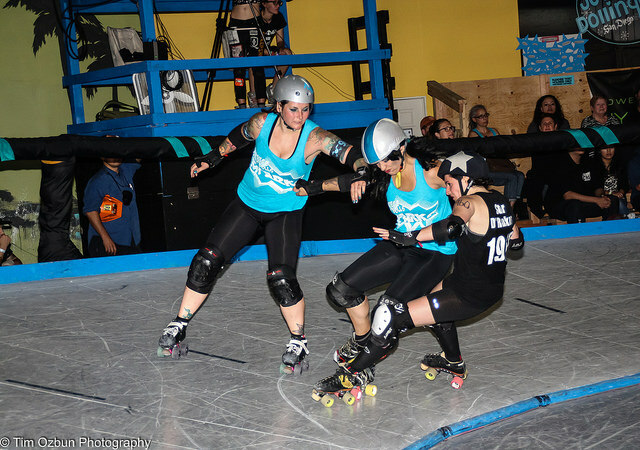 The Orange County Psycho Ex-Girlfriends also played two games this season, losing to the San Diego Wildfires on the banked track and winning against the Inland Empire Derby Divas on flat track. Their endurance is strong, but with the smallest roster of 13 skaters it is sure to be put to the test this weekend. It’s clear the team will need to rely heavily on their veteran skaters and proven endurance to win this round robin. The LA Derby Dolls are putting together a mixed team for this weekend. Most skaters are being pulled from LA’s subpool, with the remaining skaters on home team rosters. With LA’s deep talent pool, they should technically come out on top of the round robin. But with their recent facility move, loss of banked track time and having the only team that doesn’t regularly play together, a weakness may be exposed in their armor. The Penn Jersey She-Devils are the wild card in the round robin. Being the only team outside of Southern California, we don’t have the privilege of watching their games and skaters on a regular basis. Looking at their performance from previous Battle on the Bank tournaments, Penn Jersey improved immensely from 2013 to 2014. If the She-Devils continued their training and development, they could be a force to be reckoned with. The difference in the RDCL rule set, which this round robin is using, may be the game changer as penalties could affect the final outcome. This bout will be held in our private Dollhouse in downtown San Diego, open to only 200 of our closest friends and family. Street parking is free after 6:00 pm on Saturday and all day Sunday. Don’t forget to arrive early to check out the newest apparel at our merchandise stand and our vendors in the Vendor Village on the flat track under the disco ball! A concession stand will be full of pizza, popcorn, and soda. All ages are welcome and there is free admission to children 5 and under! Tickets will be available at the door until sold out. Buy your tickets now!